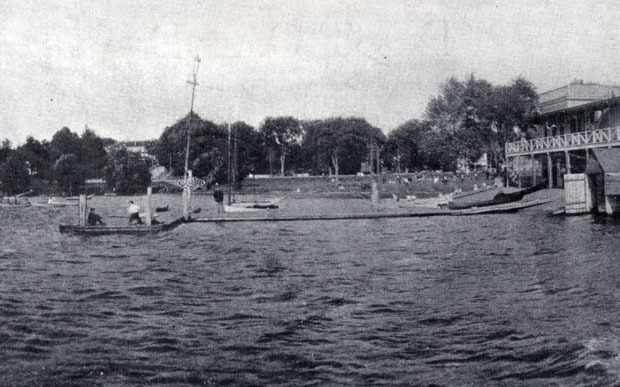 "During the first half of the last century, Lake Quannapowitt hosted regattas, motorboat and sailboat races, and other events both in the water and along the shore. The Lake was equipped with a wharf that served as a platform for the judges, members of the press and event/race committee members. In addition to launching boats during races and special events, the wharf was where boats were launched on warm summer days. According to published reports looking back at the era, 'sailboats, canoes, and row boats lined the water along the wharf...Wakefiedl residents enjoyed the serenity of boating and the cooling breezes of the lake.' The Wiley Boathouse is at the right, before the second story dance hall was added in 1912." - Text from calendar by Jayne M. D'Donofrio. “The wharf at Lake Quannapowitt, 1905,” NOBLE Digital Heritage, accessed April 22, 2019, https://digitalheritage.noblenet.org/noble/items/show/7096.